All through the middle ages, the psalter was used as a private prayerbook, a hymnal for services for laity and monks, and a text for theological study. In this manuscript the latin words have translations above (gloss) and prayers, proverbs and notes in Old English in its margins, indicating that it was used for study and private devotion. A prayer added in the early 11th century mentions two saints especially venerated at Winchester, suggesting that the psalter originated there, although other later additions and the letter 'r' in the top outer corner of the page of the beginning of Psalm 1 show that it was at Christ Church, Canterbury, in the 11th century. In the earliest English Psalters it was not uncommon to emphasise 'the three fifties': the divisions of the 150 Psalms at Psalms 1, 51, and 101. In this Psalter all three occur at the top of a page, and this one is also at the start of a new quire. 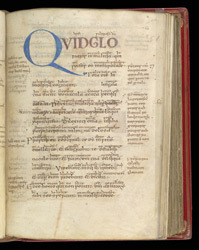 The Old English gloss in the margin was added in the early 11th century.